The stunning Loxhill Pram from our friends at Indigo Jamm is a wonderfully stylish British made toy that's perfectly sized for little hands. 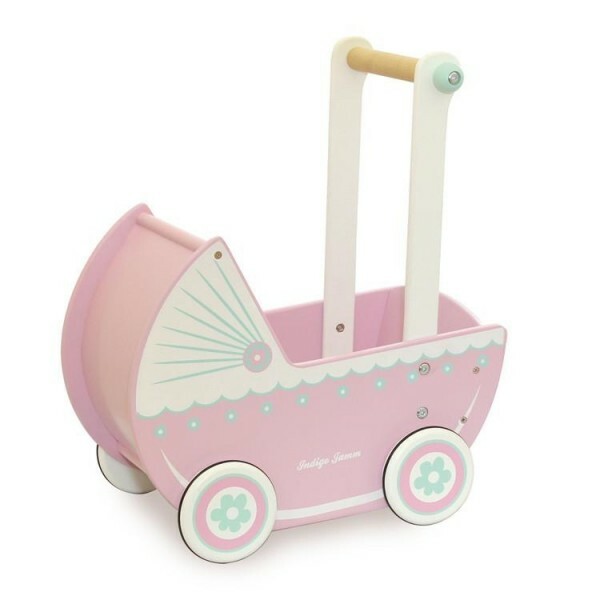 In a beautiful candy pink with intricate detailing and a natural wood handlebar, Loxhill Pram moves easily across all surfaces, thanks to its rubber edged wheels. Perfect for first walkers, this is a really lovely gift that little Mums are sure to adore! This is a strong but beautifully elegant first pram, with fantastic attention to detail and a tremendous sense of style. Loxhill Pram is suitable for dolls ans teddies up to 25 centimeters, so there's room for everyone inside! The sturdy rubber edged wheels mean it moves easily over both carpeted and hard indoor surfaces, so your little one can get around effortlessly.